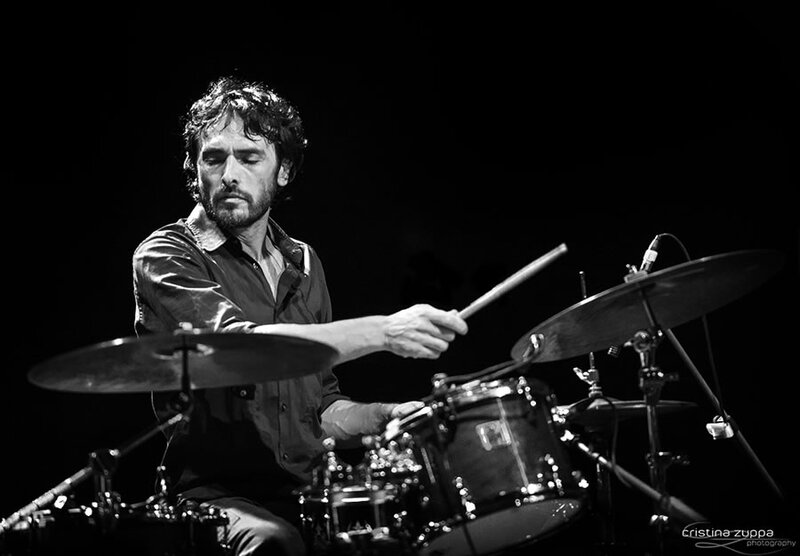 Thanks to his rich and varied background full of Pop, Rock, Ethnic and Folk music experiences, Claudio Sbrolli is one of the most popular and requested session drummer in the Italian jazz scene and beyond. At the age of 10 he started playing the piano and later the drums. After a long apprenticeship as a self-taught musician he started to study and to improve himself with Masters such as Claudio Mastracci, Ettore Fioravanti, Fabrizio Sferra, Francesco Petreni, Lorenzo Tucci and with the Master Classes held by Paul Motian, Dave Weckl, Steve Gadd, Gavin Harrison. He attended courses and master classes in Nuoro Jazz (with Paolo Fresu as art director), where he won a Scholarship as best student in his class. He also participated in “Roma Jazz School” workshops where he attended courses held by Jeff “Tain” Watts and Jeff Ballard. Among his recognitions are a Scholarship from the Saint Louis School in Rome, the accreditation as best drummer at the Trimi’ s Festival in Bologna and in 2012 he was also mentioned by Jazzit Magazine as one of the top 10 jazz drummers in Italy. He took part in several important Festivals as Calagonone Jazz, Terni Jazz, Il Moro Jazz, Biella Festival, RaiTrade Festival, Musicultura Festival, Premio Amnesty Italia, Mantova Music Festival, JazzExpo Cagliari, San Marino Jazz Festival, Casa del Jazz Roma Festival, Villa Celimontana Jazz&Image, Cantiere Internazionale d’Arte in Montepulciano and many others and he also performed in many of the most popular italian jazz clubs. In addition he also played concerts in England,Germany and Slovenia. He contributed in more than 20 recordings and he played with great musicians such as Paolo Fresu, Maurizio Giammarco, John Tchicai, Marco Colonna, Angelo Olivieri, Pasquale Innarella, Eugenio Colombo, Gabriele Mirabassi, Alberto Popolla, Raf Ferrari, Mirko Guerrini and many others. He has been teaching drums for 10 years ,first in Rome, now in Florence and in the Monte Amiata area and he has a vast experience also in musical workshops.